In a move anticipated by a number in the industry, Charles Schwab is selling its PortfolioCenter product to Envestnet Tamarac. PortfolioCenter, which is a portfolio management and reporting engine, is used by over 3,000 registered investment advisory firms who will now be searching to replace a product that they have come to rely on. For the uninitiated, PortfolioCenter was originally introduced in 2010 as a core element in Schwab Advisor Services’ plan for a “cloud-based, multi-custodial portfolio manager” set to compete with companies like AssetBook, Tamarac, and Orion. However, when SVP of Digital Adviser Solutions, Andrew Salesky took over in the summer of 2018, the company shifted gears to partner with third-party vendors while debuting their PortfolioConnect product. Envestnet announced this acquisition without reporting terms of the deal in late February while reporting its fourth quarter earnings for 2018. Tamarac and Schwab have a number of synergies; however, it remains to be seen whether or not the group can actually do enough to meet the needs of current PortfolioCenter users. Already, the team at Tamarac has tried to prevent the exodus of financial advisors currently using the PortfolioConnect product by offering to honor the contracts of current users. They also shared that “the basic PortfolioCenter package, which does not include the added on tools, costs roughly $3,000 per year, according to one advisor. To put this figure in perspective, it was also reported that the cost for current Tamarac services for a group with “$200 million in AUM and 200 accounts would cost approximately $16,000 a year.” This is a steep climb from what users were previously paying for their portfolio management and performance reporting. It’s plain to see that the multi-year (7 years!!) contracts that Tamarac is offering current PorfolioCenter users to stay onboard is simply a strategy to keep them in the fold long enough to upsell them. However, going back to PortfolioCenter user Erica Safran, she said that “the premium tools would not have provided enough value to her firm…and the length of the contract was disconcerting.” She continues, “for your home mortgage, lock yourself in,” Safran says. “But, in terms of technology, being locked in for long periods of time just doesn’t make sense. Seven years would have been a lifetime.” A lifetime of being hounded by the upsell machine and rising costs indeed. While there is and will be plenty of debate on what the top portfolio management or performance reporting platform is “the best”; many of these larger companies miss the mark on what’s really important. That’s providing a tool and a technology that seamlessly fits the need of the user without pressuring them into paying more for capabilities and services that they don’t really need. Often times more isn’t always better. If you have a process that is working and need capabilities that specifically fit or enhance that workflow, be weary of the upsell. After all, you’re in the business of making money, not burning it. Traditionally, the financial sector has been slow to invest in and adopt groundbreaking technologies. However, in 2018 we saw a number of well-established institutions kick “tradition” out the door to make way for the real world results produced by a number of fintech applications that have established their proof of concept as well as their viability in today’s market. We’re excited to announce that we have appointed Neel Dattani as AssetBook’s new Chief Executive Officer, effective immediately. Neel’s experience in driving operational excellence, fostering innovation, along with his sound leadership style made this an easy decision. His appointment is a clear reflection of the company’s current state: ready to take on the future and fired up about delivering cutting-edge products and services with our own personal touch. Posted on May 18, 2018 January 15, 2019 Author Rob MajorCategories Did You Know? The team at AssetBook would like to congratulate the winners of our technology survey appreciation drawing. The winners are Travis Woods at EFP Advisors and Karrie Thomas at Nautilus Advisors. It is very important for us to understand the other financial systems that our clients are using so that we focus our development effort on the right integrations. Thanks to all of you that participated in the survey! Posted on March 14, 2018 Author Rob MajorCategories Did You Know? As you can tell by my smiling face above, we had a terrific time at this year’s NAPFA (National Association of Personal Financial Advisors) Fall conference. AssetBook’s COO, Neel Dattani and I convened with about 300 fee-only financial planners at the Omni Resort in Orlando for one of our most successful conferences to date. Thanks to Ric Haines, the conference coordinator, we had a prime location in the exhibit hall. We were amazed by the number of clients (at least a dozen) that came by to say hello. 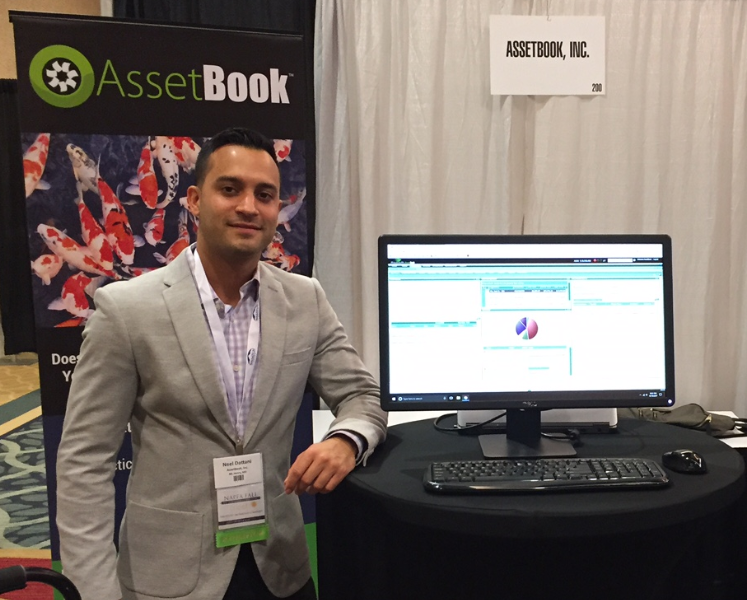 We also had a large number of prospective clients stop to see and learn about AssetBook. It was really great when we had a mix of both current and prospective clients at the booth because our current clients were the ones selling AssetBook to the prospective clients. It’s hard to beat these strong referrals, especially with this tight-knit group of advisors. One thing that I found fascinating was when he talked about setting up a network on his laptop while sitting in the lobby of the Omni resort the day prior to his presentation. He named the network “Omni Free”, and in less than an hour dozens of users logged on to his phony network. Once they logged in, he could read files, emails, etc. It was a real eye-opener for everyone in the room. For more information about expert speaker John Sileo, check out Sileo.com. The conference was everything that we could have hoped for, from the content to the location and venue. Most importantly, the quality of advisors attending the conference was as good as it gets. Thanks to all NAPFA organizers for putting on a terrific conference. Posted on November 7, 2017 Author Rob MajorCategories Did You Know? 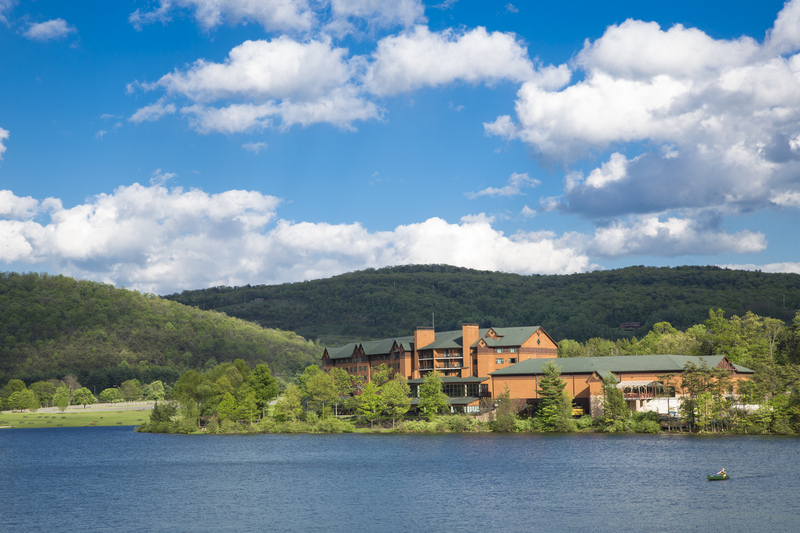 Good morning from Deep Creek Lake on a beautiful late Summer morning. We hope to see you at one of these conference this Fall! Posted on August 24, 2017 August 24, 2017 Author Rob MajorCategories Did You Know? AssetBook’s Founder, Rob Major couldn’t resist getting outside on this beautiful Spring morning. Click below to view Rob’s video and an update on our upcoming quarterly webinar. Posted on May 23, 2017 Author Rob MajorCategories Did You Know? AssetBook is proud to formally introduce its newest integration partner, Utah Educational Savings Plans (USEP). Many of our advisors have given high praise to USEP, so we wanted to share some information about their 529 platform. As of 2011, assets in direct-sold vs advisor-sold 529 plans were even—50 percent of the industry was with direct-sold plans, where the other 50 percent was with advisor-sold plans. Since then, direct-sold plans have continued to see the largest growth in the industry. 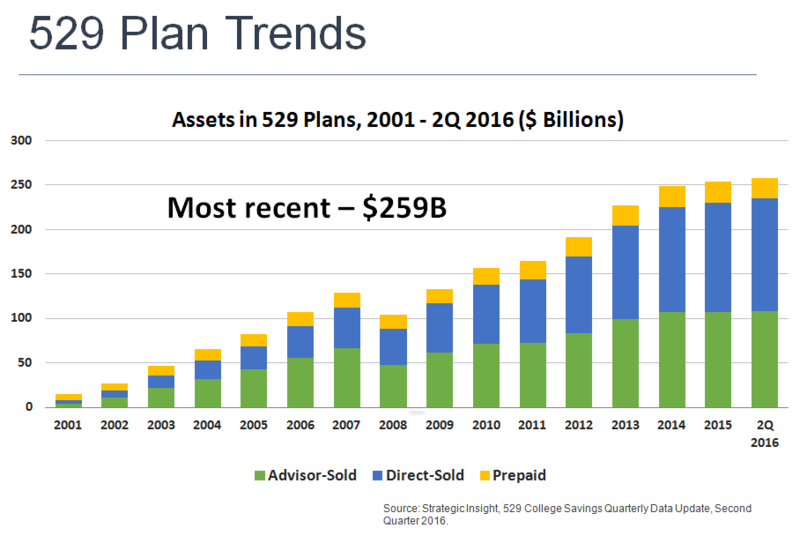 As of the second quarter in 2016, direct-sold plans have $127 billion in assets versus $108 billion for advisor-sold plans. More advisors are going toward direct-sold plans due to lower costs, simplicity, and age-based options. The rule of thumb regarding tax benefits and 529s is to tell people to look at their state’s plan first. If they have a state plan that offers tax benefits, they may want to invest in their state’s plan. It depends on their individual tax situation. 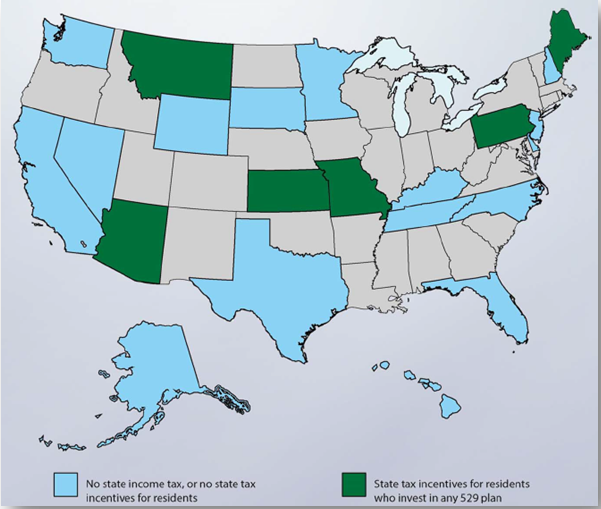 Looking at the graphic, the 16 states in blue either have no state income tax or no state tax incentives for residents. Residents of these states don’t have any enticement to stay within their state’s plan, so it affords them the opportunity to shop around and consider other states’ 529 plans. The six states in green are tax parity states: Arizona, Montana, Kansas, Missouri, Pennsylvania, and Maine. Think about tax parity like the anti-home-court advantage—there’s a tax incentive for investing in that state’s 529 plan, but the state will offer the same incentive for any plan they choose, whether it’s the home plan or not. The states in grey offer tax benefits. Some states might not have tax benefits that outweigh the fees or the tax benefit might not be an incentive. The account owner might also want to invest up to the maximum benefit for their state, and then invest anything beyond that amount in another state’s plan. Each account owner must consider his or her individual tax situation. 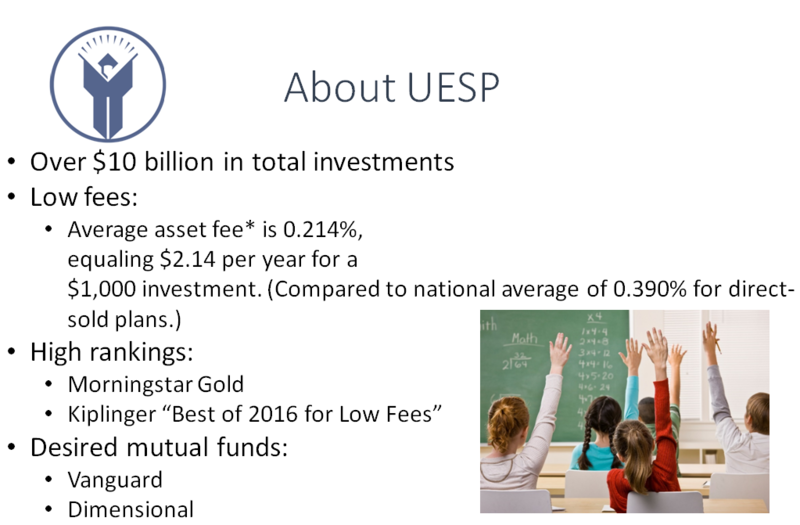 The “all-in” asset-weighted fee includes the underlying expense ratio of the funds plus the UESP Administrative Asset Fee. Highly ranked by Morningstar, Kiplinger’s, Money magazine, and consumer advocate Clark Howard. UESP is one of three gold-rated Morningstar plans, and UESP has received Morningstar’s top rating 11 of 13 years. UESP offers both Vanguard and Dimensional funds. For more information, contact UESP directly. Posted on March 21, 2017 Author Rob MajorCategories Did You Know? This year’s T3 (Technology Tools for Today) conference attracted an impressive number of attendees. With more than 600 in attendance, the conference has doubled in size the past several years. The conference also seems to be THE venue for fin-tech firms to announce new ventures, software versions, and integrations. There is no better conference for advisors keen on keeping up with cutting edge technology in the financial services sector. We noticed a couple of trends creating buzz at the show… most notably robo technology for advisors and truly seamless integration of advisor technology. On the robo front, we noticed that in addition to established portals like Betterment and Oranj, systems new to the space like Advisor Engine not only showed up but sponsored the conference at the Platinum level. Riskalyze announced its own new robo-esque platform as well. It appears that advisors are continuing to embrace the technology that the robos are bringing to the table. These platforms eliminate the need for human intervention to assist in client onboarding, risk profiling, model design and implementation. Seamless integration of advisor facing apps may seem like a broken record at this point. Some of you may remember the decade-old Silver Bullet campaign. Until now, it really hasn’t evolved all that much as most integrations between advisor apps still use old-school “push-pull” techniques or old-school web services. Modern APIs are the key to achieving rich and meaningful integration of your CRM, PMS, Planning and Trading systems. It also seems like the custodians may play a role in connecting the APIs in a standard way. As always, we enjoyed the speakers, especially Bob Veres. Bob was talking about “The One Solution”, which refers to his theory that the financial planning industry is basically “stalled” in terms of advisors attracting new clients. 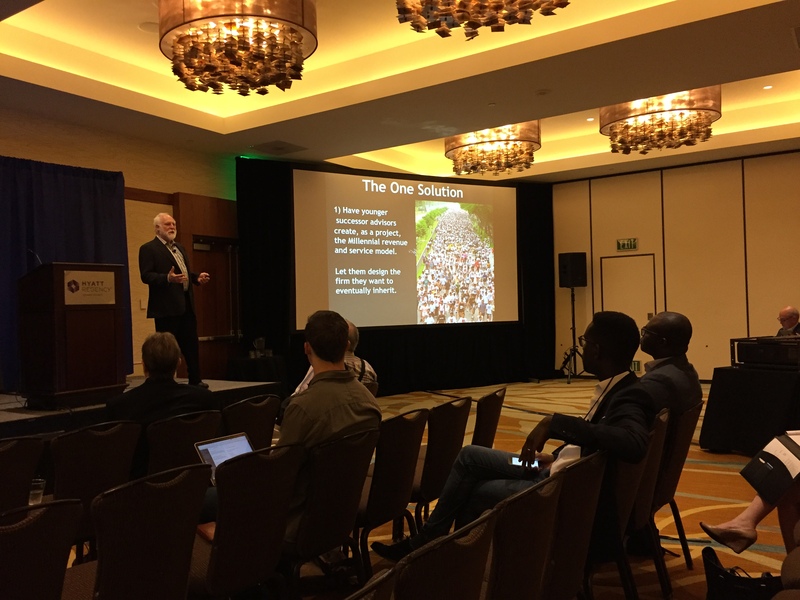 In summary, Bob presented a viable solution to the problem that included employing younger succession advisors, improving your on-line presence including digital reporting, leveraging communication technology (like Skype and Facetime), and building niche communities of clients to serve. The presentation was enlightening and Bob goes into detail on his theory, as well as many other revelations in his new book named The New Profession. In our opinion, the book is excellent and is a must-read for financial professionals. 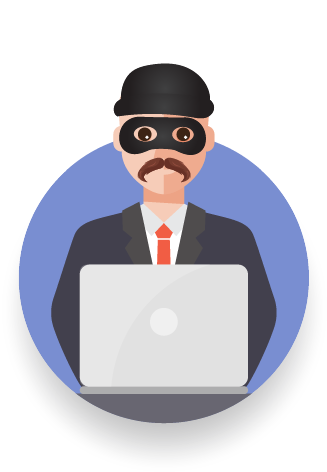 Finally, Rob Major spoke on the topic of identity fraud in a presentation named “The $100,000 Lesson Learned.” He shared a true story about how a client of a well-established RIA firm was victimized by a fraudster, and how and why the RIA was responsible for paying the money back. Again, we can’t say enough good things about the T3 conference and hope to see you next year in Ft. Lauderdale, FL for the 2018 conference. It will be held February 6-9, 2018 at the Marriott Harbor Beach Resort and Conference Center.